HORLOVKA, Ukraine -- With a walrus moustache, a fiery temper and a reputation for brutality, Igor Bezler is the most feared of all the rebel leaders in eastern Ukraine. 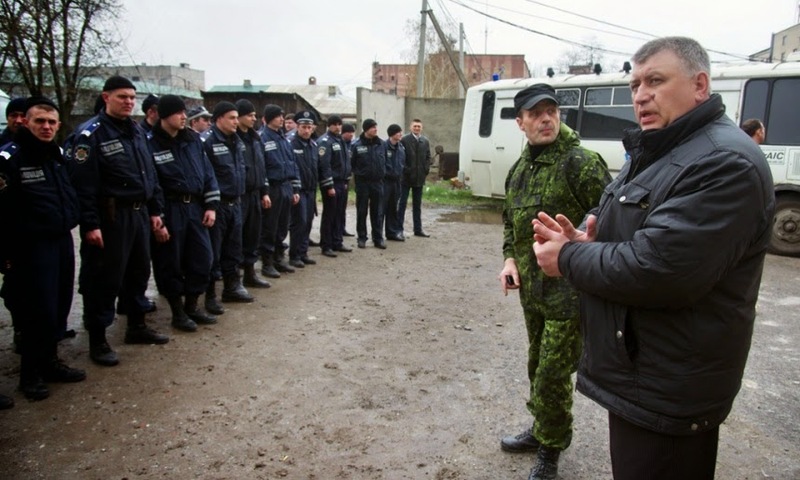 Igor Bezler, in green fatigues and without his walrus moustache, is at a briefing of policemen in Horlovka. Nicknamed Bes, or “the Demon”, he is regarded as something of a loose cannon, even by other rebels, who speak about him in hushed tones. If the Ukrainian security services, the SBU, are to be believed, the Demon and a group of his men were responsible for shooting down Malaysia Airlines flight MH17 over the region a fortnight ago. He asked whether it was small or big, and was told that it was hard to see, as it was flying high above the clouds. In another recording, apparently made 20 minutes later, the Demon reported to his interlocutor, supposedly a Russian intelligence official, that a plane had been shot down. Bezler said the recording was real, but referred to a different incident: as well as allegedly bringing down MH17, the rebels have shot down 10 Ukrainian aircraft. The Demon hardly ever gives interviews, but a Russian journalist and I managed to secure one, so we set off last Thursday to visit his headquarters in the town of Horlovka, a 40-minute drive along deserted roads from the regional capital of Donetsk. Previously a normal east Ukrainian town, with decaying Soviet-era industrial plants and a political elite that skimmed off the financial flows that might have helped lift it from its decrepit state, Horlovka has become the Demon’s fiefdom in the three months since the uprising started. At the entrance to the town was a checkpoint with barricades of sandbags and armoured personnel carriers pointing their guns at the road. It was manned by rebels armed with Kalashnikovs and rocket-propelled grenade launchers. The man on the post, who introduced himself as Gorynych – a three-headed dragon of Russian folklore – did not want to let us pass, but we explained we had an interview with the Demon himself. Phone calls were made, and we were allowed to enter the town. Arriving at the government building that the Demon’s fighters had seized at the start of the uprising, we were led through several barricades, made up of sandbags and stacked ammunition boxes, and brought to the first floor, where there was a waiting area for those who sought an audience with the Demon. Periodically, fighters came dashing up the stairs with news for the boss. Before they entered his office, they had to leave their telephones and weapons on a table. One man with a Cossack fur hat deposited two pistols, a Kalashnikov, a foot-long dagger and an iPhone 5 on the table before he was allowed into the Demon’s inner sanctum. While we waited, a group of fighters made us tea in plastic cups with a lilac-coloured kettle, and we talked about life in the war zone. The rumble of shelling in the distance was audible. It had been getting closer every day, said the fighters, as the Ukrainian army continued retaking towns, not without civilian loss of life. Some of the fighters were locals; others had come from Russia and attended a training camp in Rostov, across the border, before being sent to the Demon. One was a local who had lived in Moscow and worked as a lighting engineer for photo shoots. He found holding up an umbrella all day demeaning work, and longed for something more meaningful. When the insurgency started, he returned to his home town, and now he looked every inch the fighter, with a flowing beard, irregular fatigues, and a waistcoat with pockets for knives and ammunition. The fighters showed me a room in disarray, filing cabinets tipped over and documents strewn across the floor. In the corner, incongruously, was a petting zoo of 10 rabbits. One of them was a huge, white specimen that the fighters had nicknamed Yatsenyuk, after the leader of the Maidan protests in Kiev, who went on to become prime minister and resigned last week. They said they planned to skin, cook and eat Yatsenyuk soon. It was unclear if they were joking. In the bathroom, instead of toilet paper, a copy of the Ukrainian legal code sat on the holder, half of its pages ripped out. The door to the Demon’s office opened and the man himself emerged, cigarette in hand, wearing a telnyashka – the stripy Russian naval vest – underneath military fatigues. In an instant the fighters were on their feet, standing rigid and saluting. One meekly explained that two journalists were waiting to see him. “I’m busy. We will talk later. For now, show them the prisoners,” he snapped, striding down the stairs surrounded by heavily armed men. The Demon was born in Crimea as Igor Bezler and lived for a long time in Russia before moving to Horlovka, where he worked for a time as the director of the local funeral parlour. The SBU claims he is a Russian military intelligence agent who coordinates his actions directly with Moscow. He is one of a number of key commanders of the rebel movement who Kiev claims are Russian agents, including the mysterious figure of Igor Girkin, nicknamed Strelkov or “the Shooter”, the commander-in-chief of the Donetsk resistance. An enthusiast of military re-enactments, Strelkov himself has admitted he was a Russian agent until last year, and that he took part in the Russian takeover of Crimea. It is possible that men like Bezler and Strelkov are not directly carrying out Moscow’s orders but are proxy agents with handlers two, three or four steps removed from the Kremlin or other official Russian structures; players who can be directed from Moscow but who are also liable to go rogue at any time. Bezler, Strelkov and many of the other commanders in the patchwork of rebel groups in eastern Ukraine have all taken hostages. At the headquarters in Horlovka, we were led down to the ground floor and into two small rooms filled with mattresses. In one of the rooms I met Vasyl Budik, a local journalist arrested for supposed links to Pravy Sektor, a Ukrainian far-right group. He had been a prisoner for nearly three months, and was subjected to a mock execution on video to pressure Kiev into agreeing an exchange of the remaining prisoners. There was also a 64-year-old Swede, who did not want to say what he was doing when captured (though he said he was not involved in combat), and a number of Ukrainian soldiers. One of them was with his wife; she had travelled from Kiev and voluntarily entered captivity so she could be with her husband. As we talked, guards came for Budik and took him up to the main courtyard. A van had arrived, serving as an impromptu hearse, carrying the body of a rebel fighter who had died in combat. The Demon and the other fighters crowded round the open doors of the van to glance at the open coffin and pay their respects. “I knew him well, since he was eight years old,” he said. I remarked what an extraordinary testament it was to the mindless, fratricidal nature of the conflict that he was mourning the death of one of his captors. “You think that’s weird. They’ve got a high-ranking SBU official as a prisoner here, and one of his in-laws is guarding him,” he said. The Demon materialised outside the rooms holding the hostages and told us he was ready to talk, but as we turned to walk to his office, he became agitated over the question of why he keeps hostages. He looked at us with furious eyes. “The only reason they are here is because they are Ukrainian army soldiers,” he said, gesturing at the rooms with the hostages in. His voice grew louder as he grew more angry. By this point he was shouting at the top of his voice, and suddenly noticed that the Russian journalist I was with had her Dictaphone on, and that I was making notes in my notebook. He grabbed the Dictaphone from her hands and ordered one of the fighters to throw it at the wall. Pulling my notebook from my hands, he began to rip out the pages frantically. Protesting only made things worse. Working in eastern Ukraine has been difficult for all journalists and anger and threats are commonplace. This was the first time, however, that I felt a very real sense of danger. “Don’t think for one minute I will hesitate to have you shot,” he yelled at the pair of us. We were taken into a room where our bags were rummaged through by underlings, the gravity of the situation underlined by just how scared the rebel fighters themselves appeared to be. Twenty minutes later, as a nervous woman was methodically flicking through our possessions and I was clandestinely deleting all photographs and messages from the phone in my pocket they had not noticed, the Demon appeared at the door again, smoking a cigarette. He had calmed down, somewhat. “Give them back their things. Drive them to the checkpoint, kick them out and never let them in,” he barked. We left hastily, and I never did get to ask the Demon about his alleged role in shooting down MH17. Three days after our visit, on Sunday, Horlovka was ruthlessly shelled with Grad rockets. Meaning “hail” in Russian, the Grad can launch up to 40 rockets in a matter of seconds, and is a spectacularly imprecise weapon designed to inflict maximum casualties. The missiles hailed down on central Horlovka without warning, with plumes of smoke rising from buildings across the town. The Demon was not there when the attack came; the Ukrainians say he has fled, his fighters say he left Horlovka on a mission. But the missiles missed the headquarters anyway, coming down in various residential areas. As the conflict enters what looks like an endgame, both sides are more resolute than ever. When the bodies began to fall from the sky earlier this month, the downing of MH17 seemed like an event so outlandish, so gruesome, that some thought it might just act to jolt the players in the region’s conflict to their senses. A collateral massacre whose victims had no stake in the conflict on the ground, it was surely enough to end a war that has appeared largely manufactured, but has nevertheless cost hundreds of civilian lives. Instead, the fighting has intensified. The pro-Russian rebels have continued to down Ukrainian planes and Kiev claims Russia is still funnelling weapons and fighters across the border. Ukrainian forces, meanwhile, have intensified their attacks on the rebels and appear to have used indiscriminate missile systems against civilian areas. The conflict, far from calming down, has entered its most vicious stage yet. Around 13 people died in Horlovka on Sunday, including a mother and her young child. A haunting photograph of the pair lying on the ground, the mother’s body badly mangled but one arm still cradling the corpse of her child, was shared on social media and led to another round of both sides loudly blaming the other for the atrocity. The headquarters of the Ukrainian anti-terrorist operation denied it had used Grad missiles on Horlovka, instead blaming the rebels, saying they had carried out the attack to “discredit the Ukrainian army” among the town’s residents. Ukrainian forces have repeatedly denied using Grads against residential areas, and it is true that both sides have the missile launchers in their arsenals. However, Human Rights Watch found that on the outskirts of Donetsk there was compelling evidence that shelling had come from Ukrainian positions. The rebels have a healthy supply of weaponry and, if Kiev is believed, are still receiving shipments from Russia. But they are no match for the sheer size of the Ukrainian army and the various volunteer regiments fighting on Kiev’s side, whatever state of disarray the government forces may be in. Deep down, they all expect to die here. One of the Demon’s men, a jovial Muscovite, gave us a number to call so we could tell his relatives where to find his body when he is killed. None of his family knew he had come to Ukraine to fight. “There is nowhere for us to go now. We will fight until the end, until the last drop of our blood is spilled and the last one of us is dead,” he said. The question is how much more civilian blood will be spilled before that happens.